Submitted by mahoney on Thu, 04/24/2008 - 10:41am. 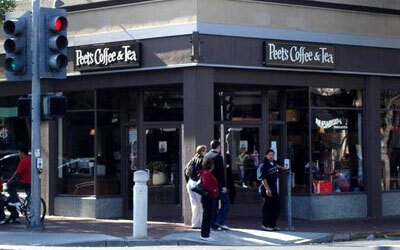 Peet's Coffee & Tea throughout the USA...Peet's Coffee & Tea is a specialty coffee roaster and retailer. Founded in 1966 by Alfred Peet in Berkeley, California, Peet's has a devoted following, sometimes known as the Peetniks due to their strong customer loyalty to Peet's wide range of varietals and signature blends of coffee and tea. Peet's is especially known for its strong, dark-roasted coffee. Removed those locations and updated the remaining locations in the file. Notification that All locations in MI, OH an PA have closed. Updated the file with the latest data from the website. Submitted a number of locations that were formerly Caribou locations. Peets obtained the Caribou chain. Submitted a number of additional Partner locations. Updated the file. It now includes 69 Partner locations. NOTE: Peet's cards,coupons, promotional offers are not redeemable. Updated the file from their latest website listing. Udpdated the file to the latest website listing. Udpdated the file to the latest website listing. Also added the store hours to column D.
Noted:The locations in Chino Hills,CA and Anaheim,CA have closed. Reformatted the file and also compared the file to the website locator. Locations now total 236. Submitted corrected coordinates for the Hasting Ranch location. Submitted 1 new location in Pleasanton, CA.